Philippe Quint performs at Newark Liberty International Airport. "I cannot describe it in words, the feeling that I was going through at the time. I was frantically looking for the violin that whole morning," Mr Quint said. After leaving it in the taxi on his return from a performance in Dallas, Mr Quint rang the police and the Port Authority of New York and New Jersey. The following day Mr Khalil was put in touch with Mr Quint, and soon the violin was returned. "He just saw it in the back seat there. He had no idea how priceless this instrument was," Mr Quint said. Mohamed Khalil, who was born in Egypt, was given a reward of $100 (£50) by Mr Quint, and was also presented with a medal from the City of Newark. In addition to the airport performance, he and his family are also being given tickets to Mr Quint's next New York performance, at Carnegie Hall in September. The violin was made by the Italian Antonio Stradivari, and then owned by the 18th-Century German composer and violinist Christophe Kiesewetter. It has been valued at $4m (£2m). 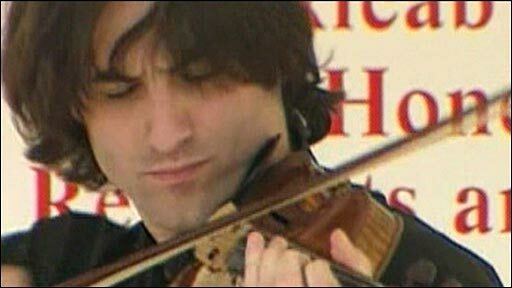 In 2006 the Stradivari Society arranged a loan of the instrument from its current owners, Clement and Karen Arrison, to Mr Quint, who has been nominated for a Grammy award. How to repair a valuable violin?